Wudang Mountain Intangible Heritage Culture Week kicked off in eastern China's Shanghai on August 10, 2017. 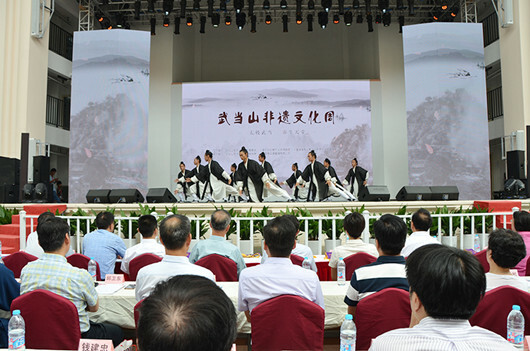 Performances of Wudang wushu, Taoist music, Taoist medicine, etc. attracted tens of thousands of Shanghai citizens. The 5-day culture week will last till August 14. It consists of an opening ceremony, entertainment activities, exhibitions, experiencing programs and exchange activities. Wudang Mountain, in the northwest of Hubei province, is perhaps the best known of China's Taoist holy mountains. It was listed by UNESCO as a World Cultural Heritage Site in 1994. The mountain is famous for its perfect combination of natural and cultural scenery. It is also renowned for its magnificent ancient buildings, profound traditional Taoist culture and Wudang wushu.